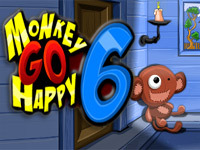 Monkey Go Happy Marathon is a fun and entertaining game for children of all ages. It features cute, furry monkeys whom you must cheer up by completing increasingly difficult challenges. As you progress through each level, the challenges get harder. We have come up with a walkthrough tutorial to help you successfully beat each level, and make your monkey incredibly happy! When the fly is directly over the Venus Fly Trap plant, click on the plant to make the plant eat the fly. Click on the bread box to open it. Remove a slice of bread by clicking on it. Click on the toaster to drop the bread inside. Click the toaster lever to pull it down. When the toast pops up, click the lever again until the toast is burned black. Quickly click on the hamster that is running across the floor. Once you’ve captured the hamster, click on the hamster wheel to place hamster inside. Find and click on the pitch fork. Click on the hay pile to pick up hay with the pitch fork. Click on the feeder to drop the hay and feed the animals. Find and click on the chalkboard eraser. Click on the chalkboard to erase. Find and click on the chalk. Click on the chalkboard to draw a picture. Find and click each shape to pick them up. Place each shape into the correct places. Click the center circle to lock the shapes in the holes and push open the secret compartment. Click on the chicken coop door to open. Click on the chicken to move it away from the nest. Click each egg to pick up. Click on the basket to place egg inside. Pick up the rifle by clicking on it. Aim the crosshairs over the blue balloons and click to shoot them. Place the ice cream cone into the cone holder by clicking on it. Click the ice cream dispenser’s lever until ice cream spills onto the ground. Move your cursor over all of the bubbles to pop them to receive extra bonus scores! Turn on the T.V by clicking on the yellow power button. 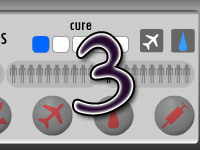 Start the video game by clicking on the red button. Make the video game horse jump over obstacles by clicking on the joystick. Find and click on the pole located under the bed. Use the pole to get the key on the other side of the bars. Unlock the bars using the key. Find and click the golf club next to the large monkey face. Pick up the golf ball located on the other side of the monkey face by clicking on it. Using the golf club, hit the ball at the appropriate time to make the ball go through the monkey’s mouth and into the hole. Pick up the film located on the floor by clicking on it. Click on the empty film area to place film onto the projector. Click the red power button to turn on projector and watch the movie. Click on the rug to roll it back. Click on the closet door handle to open the door. Pick up the broom by clicking on it. Using the broom, sweep the trash under the rug. Click on the rug to roll it out again. ©2019 Monkey Go Happy Marathon 4. All rights reserved. Monkey Go Happy is a trademark owned by pencilkids.com . This website is not endorsed by or affiliated with pencilkids.com in any way.